More and more businesses are undergoing a digital transformation. What does that mean? For many, it’s implementing multi-cloud solutions in an age of big data. If that sounds like a lot of buzzwords, let’s break it down. Businesses are choosing cloud solutions, but they aren’t without security risks. Meanwhile, it’s becoming popular to run a business on democratic, high-velocity data. 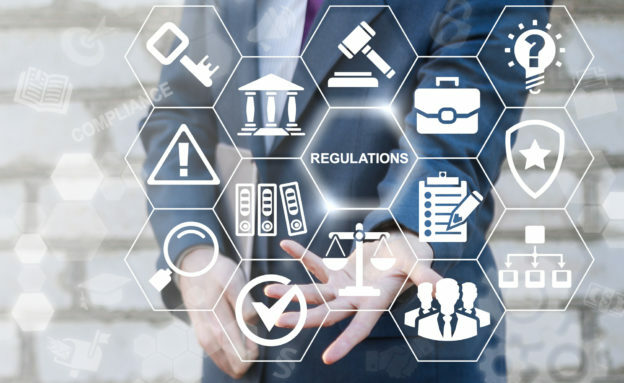 What Are IT Regulatory Compliance Solutions? Regulatory compliance solutions refer to software and services. These tools ensure compliance with the regulatory boards of their industry. The term regulatory compliance means conformance to certain policies and standards. These are industry-specific or general business regulating agency. This is important for businesses because it ensures client information is safe. It helps businesses protect against advanced persistent threats. Compliance also ensures security standards are uniform across all businesses in an industry. This is important in a digital era. One where businesses must protect clients from vulnerabilities. Solutions for IT regulatory compliance come in two major forms: software and services. Choosing the right compliance solutions means selecting between software and services. Software refers to programmatic applications that offer solutions where applied. Software tools help business leaders understand which compliance regulations apply to their business. And how to conform to them. It also covers things like compliance asset tracking. This helps small businesses keep track of inventory where compliance is being applied. The software is good. But the problem is that it’s only effective where applied. There’s concern about human error and adherence to protocol. For people who are cautious, a better solution may be regulatory compliance services. These services, managed by a third-party provider, dedicate effort ensuring your company’s compliance. Vendors use consultants with expert-level knowledge, paid to ensure compliance. Partnering with a third-party provider takes some of the guesswork out of compliance. And ensures your business is right on the requirements of standards organizations. IT regulatory compliance solutions are a tricky subject for any business to navigate. Look at the recent handover of compliance regulations to GDPR. When the GDPR became the bread-and-butter of internet security, website compliance changed. Businesses changed to meet new standards, or suffered consequences like hefty fines. For employees, compliance isn’t something that can be an afterthought. It takes professionals, and that’s where a good service can help you. Whether you opt for software or services, it’s important to have at least one. For more information about security consulting, click here.